Our cattery specialize in breeding the best quality Siberian traditional and colorpoint cats. Our available kttens are featured in subsections. Our Siberian kittens leave for their homes at about 80 days of age. 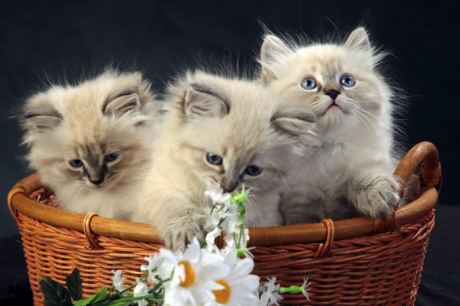 At that time, they will be litter trained, age-appropriately vaccinated, and registered as purebred cats. Each litter has its own number for the kittens names. All the names has the adding SIBERIUS (the name of the our cattery). We supply a detailed sales contract, a comprehensive health guarantee and instructions on kitten care. The kitten is handed to its new owners according to the contact conditions. The International Veterinary Certificate for Cats) and Kitten Card (which should be exchanged for WCF Pedigree till to 12 month of age, except for the contactc with sterilizing condition) are supplied with the contract. We guarantee life-long help and consultations to all cats bred in our cattery. The price for our cats is agreed price and it depends on some factors^ fur color, eyes color, the number of the available kittens, the health of the kitten, the cost of the transporting and so on. Our prices range is 250USD to 1500USD. It is possible to make advance payment in case of reserving. Reserving is available up to two months of the kitten age. We can transport kitten to Moscow, St. Peterburg as well as other Russian cities and abroad.